Some of Monday’s commentators will be pleased, some annoyed, if I now take up the question of whether the use of intrusive r is to be regarded as a characteristic of RP. the implicitly agreed model of good BrE speech? a codification intended mainly for EFL pedagogical purposes? or an objective description of how people at the top of BrE social stratification actually speak? Let us examine the three specialist pronunciation dictionaries from this point of view. 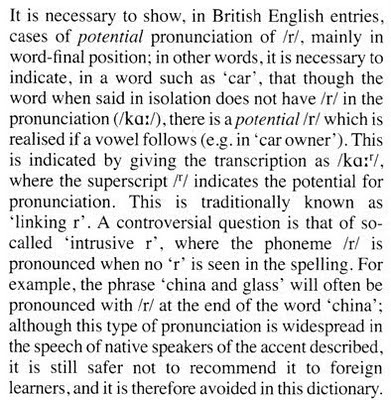 Here is what the Cambridge English Pronunciation Dictionary, says (17th edition, 2006, Daniel Jones, edited by Peter Roach, James Hartman and Jane Setter) on the subject of r links. So as far as intrusive r is concerned you could say that EPD prioritizes “safe” advice to learners over the documentation of reality. The raised r symbol replaces the asterisk used by Daniel Jones in earlier editions of EPD. While recommending foreign learners to use linking r only in such cases, Jones also (12th edition, 1963) carefully and in great detail explains how intrusive r in words ending in ə, ɑː, ɔː but not transcribed with the asterisk “is a very noteworthy feature of south-eastern English”. In the current EPD, Jones’s page-long discussion has been reduced to the two sentences you see here. The environment in which intrusive r is perhaps most disfavoured is in word-internal position, between a stem and a suffix beginning with a vowel sound. Thus the pair sawing and soaring are distinguished by some, but certainly not by all, real-life RP speakers. EPD, in line with its policy stated above, entirely ignores the possibility of an r link in the former. Tomorrow we’ll look at ODP. I'm not an RP speaker (I speak SSE, which is rhotic) but I live in the South East of England and I have to say I've never heard an RP speaker pronounce "china and glass" (or similar) without a linking R.
Surely this distinction between words ending in R and those without is an artificial one for non-rhotic speakers, concocted by prescriptivists (and possibly speakers of rhotic accents)? There is a lot of loaded language in this piece, I’m afraid. We’re given a list of alternatives concerning how we choose to define RP (though I have been saying for a long time that I have absolutely no interest in defining RP), but these alternatives do not strike me as exclusive. JCW says “EPD prioritizes ‘safe’ advice to learners over the documentation of reality”. I would have thought that the statement in EPD that “this type of pronunciation is widespread in the speech of native speakers in the accent described” constituted at least a nod in the direction of reality. “EPD … entirely ignores the possibility of an r link in the former”. The phrase “entirely ignores” strikes me as an accusation of carelessness or wilful suppression of facts. The editors of EPD are perfectly well aware that some people pronounce an /r/ in ‘sawing’, but choose not to recommend it as representative of the model accent. I have met quite a few foreign students who have been penalized in exams in their home countries for using such pronunciations. “Tomorrow we’ll look at ODP”. Readers, can we guess what the conclusion will be about which of the three dictionaries gives the best treatment of “intrusive /r/”? Easy one if you look at them. Still, as vp and Leo in the comments to Monday's post, I'd be curious how widespread it is to have the automatic (rather than educated) distinction in a reasonably consistent way. Sorry, Peter, I really was trying to be objective. I think all three dictionaries, including EPD, take perfectly respectable lines on this issue. We all face the same dilemma, and I am not sure that LPD has found the right solution, either. I have struck through the word "entirely", which on reflection I think was not well chosen. I meant that the possible r was ignored at the entry, not in the dictionary as a whole -- indeed I reproduce exactly what you said about the matter in the Introduction. I favour the second interpretation of RP. I suspect that teaching linking r is likely to confuse students and, since there is no problem with not using linking r, it is best not to teach it. Germans can always spot an English person if they put an r into "habe ich". If one were to adopt #3 pedagogically, and undertake to teach intrusive as well as linking /r/, how would one go about teaching it? Is it lexically specific, or predictable? I'm enjoying the discussion of the status of non historically justified linking r (I'm not keen on the less than neutral term 'intrusive r'. I wonder who coined it. A phonetician or an elocutionist? If JWL is reading this, perhaps he can clear that up for us.) and, indeed, the matter of RP definition. A bit of empirical data would go a long way here. I'm inclined to think in this and similar matters that an analysis of newsreaders' habits would be informative. If such speech-conscious informants could be shown to use it regularly, that'd give weight to an argument that it isn't as stigmatised as it was and maybe goes unnoticed (perhaps the evil glottal stop has taken the place of Laura Norder in the consciousness of the nation). And some figures on contexts would be nice. For a word-final schwa, r-linking seems to be preferred. NURSE in final position without an ? Pretty rare - myrrh and a few French words. NEAR - idea and Korea. SQUARE - yeah. THOUGHT - awe, saw, straw, caw, draw, flaw, paw, gnaw, guffaw, jaw, law, maw, raw, squaw, thaw, and a few more. How many of these words can have a suffix added beginning with a vowel? How many of those words are commonly heard? There seems to be a strong correlation between the use of this type of r-linking and size and frequency of these lexical subsets. Could there be then an argument for including such linking for word-final schwa in the pronunciation dictionaries (overtly, in the entries, I mean)? These are rather advanced reference works, after all, with lots of subtleties already included. Why not one more? A simplified version of the facts is always available in non-specialist efl dictionaries. My mind goes back to an earlier topic here. The separate lives of orthography and pronunciation. It looks to me as though spelling has had a big influence here. That's not to say that those who don't use r-linking in this context are a bunch of phonies (to quote Holden Caulfield), but I see the influence of spelling on pronunciation somewhere back in the mists of time. What do we mean by EFL? If it means university students of English, then we can tell them the facts as they are. It'll be no worse than their lectures on Old English. If it means commercial efl and primary/secondary schools, I think teachers will have their hands full with other things. And rightly so. Paul Carley: I reported some empirical data on newsreaders in my blog for 27 April 2007 (here). You can read it in extenso in Bente Hannisdal's Bergen University PhD thesis (2007), Variability and change in Received Pronunciation. In thirty hours of British TV newsreader speech, she found that linking /r/ was used in 59.8% of possible cases, intrusive /r/ in 32.6%. For a word-final schwa, r-linking seems to be preferred. NURSE in final position without an ? Pretty rare - myrrh and a few French words. What "an ?" is supposed to be? No, didn't work. That's odd. I wouldn't call that advanced phonetic typography. Can anyone suggest why? I'm not sure whether 1) this has been documented, or 2) it has any relevance to theory, but I think it's interesting: a feature of some Merseyside speakers is an intrusive r between the word "a" and a filler "er", "erm" or "um". So you get something like [əɹəm:]... I think, though I'll have to listen carefully to my wife and her family (from Liverpool and the Wirral) to confirm, that this can occur whether the following noun begins with a vowel or a consonant. Paul C: because to get an angle bracket in a web document you have to enter it as ampersand-lt-semicolon (<) or ampersand-gt-semicolon (>). See your HTML manual. I would hardly count [r] after "myrrh" as intrusive R. The final orthographic h is silent in all accents, and the word historically and in rhotic dialects ends in /r/. I'm retired now but I still constantly look at things with the eyes of an EFL teacher. Personally, I have no policy doubts. 1. It's always worth giving students the opportunity to pick up linking r untaught. 2. If not caught it must be taught. A pronunciation without the feature is intelligible but not 'friendly'. 3. I would never correct an intrusive r.
4. I would only discuss intrusive r in the unlikely event that a student recognised it as a difficulty. When my wife was less than a year out of Russia, a linguistics lecturer friend went to so far as to congratulate her effusively when she asked for 'vɔdkər ən 'ɔrɪnʤ. On a different tack, I do have a policy doubt. How should non-rhotic EFL teachers react to rhotic pronunciation from learners? I would hope that learners would pick up my non-rhoticism, but would not instinctively make an issue of it. Some British EFL materials are still on the surface strongly committed to teaching RP, but I detect little depth. Thanks! I don't know what I was thinking when I included that. Staring at word lists too long sometimes makes you blind to the obvious. That thesis looks quite interesting and I'll have to take a more careful look at it, but... doesn't the fact that the adverb pretty is pronounced with  but city is pronounced with [t] means they're different phonemes? Assuming they don't break the rhyme between city and the adjective pretty (which would screw up several of the best songs ever), we've got a prI4i prIti minimal pair here. (And in the 27 April 2007 post I read "The /r/ was realized as [ɾ] only in foreign names (Igor Ivanov); otherwise it was an ordinary [ɹ]. (Compare Daniel Jones’s pronunciation, where the tap was the norm for all linking r.)" This reminds me that I really have to get rid of my habit of pronouncing /r/ as [r] or [ɾ] (originating from my being an Italian native speaker, I guess), as people seem unable to tell whether I'm saying where is or what is more frequently than context and chance would allow them.